The ruler of the Gulf state of Qatar has said Arab countries should send troops into Syria to stop government forces killing civilians there. 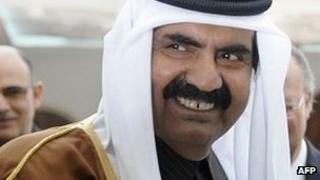 Sheikh Hamad bin Khalifa Al Thani told US television channel CBS "some troops should go to stop the killing". It is the first time an Arab leader has publicly called for military intervention in Syria. More than 5,000 civilians have been killed since anti-government protests erupted in Syria in March, the UN says. Qatar was the first Arab country to join the Nato-led operation in Libya, which led to the downfall of Libyan leader Col Muammar Gaddafi. It has also led regional criticism of the crackdowns on protesters by President Bashar al-Assad in Syria and in Yemen by President Ali Abdullah Saleh. Interviewed on the 60 Minutes programme, Sheikh Hamad was asked if he was in favour of Arab nations intervening in Syria. "For such a situation to stop the killing... some troops should go to stop the killing," he said, in the programme to be broadcast on Sunday. Qatar's proposal to send Arab troops to Syria demonstrates the mounting concern over the killing of civilians. Last week, the head of the Arab League, Nabil Elaraby, warned that Syria may be sliding towards civil war. The international community has been insistent that the Arab League should remain at the forefront in trying to resolve the situation in Syria. However, the League is divided, with Qatar one of the strongest critics of the Assad regime. Qatar played a key role in bringing down the Libyan dictator, Colonel Gaddafi. It gave extensive financial and material support to Libya's rebels. There was no question of "putting boots on the ground" but it did offer air support to Nato. The Afro-Middle East Centre, a think-tank based in Johannesburg, says the Arab League has not recovered from the Libyan crisis, and has been more careful in dealing with Syria. So the deployment of Arab troops in Syria seems a most unlikely prospect. The Arab League despatched 165 observers to Syria to monitor compliance with a peace plan, but members have expressed doubts as to the mission's efficacy. One of the observers resigned last week, calling the mission a "farce" because of impediments by the Syrian government. Anwar Malek said he had witnessed war crimes in Syria. Two Kuwaiti observers were wounded when their convoy was attacked in the city of Latakia. Plans to extend the mission were put on hold as a result of the incident. The observers are due to complete their initial four-week deployment on 19 January. Their report will be discussed by Arab League foreign ministers at a meeting next Saturday. The league has said it may refer Syria to the UN Security Council if the monitors' report is negative. China and Russia have so far blocked any UN action on Syria, fearing a Security Council resolution could lead to another international intervention, such as occurred with Libya. The head of the Arab League, Nabil al-Araby, said on Friday he feared Syria was sliding into a full-scale civil war. More than 400 civilians have been killed in Syria since the observers began their mission in December, according to the UN. In Syria, troops backed by tanks are continuing an assault, begun on Friday, on the rebellious mountain town of Zabadani, near the Lebanese border, witnesses say. Reuters news agency quoted an exiled opposition leader as saying 40 people in the town were injured in the fighting on Saturday. It was the biggest attack on opponents of Mr Assad since the Arab observers began work on 26 December, Reuters said. Casualty reports are hard to verify because most foreign media are barred from reporting freely in Syria.